The Consign-A-Car concept is to offer a total service to vehicle owners never offered before. It is a complete package that takes care of every detail to professionally market your car and achieve the best result possible. Secure Premises to Display Your Car — We provide a secure sales yard with main road exposure to display your car. 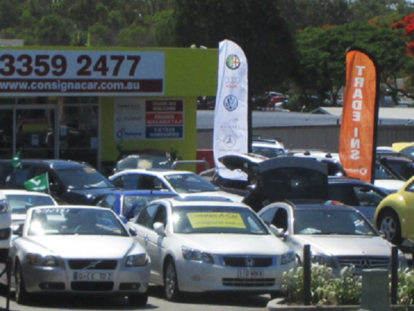 Our dealerships are not a simple park and pay or sell situation, rather a professional sales premises. We take care of signs, cleaning and displaying your car in a manner so it will sell. Advertising — We will advertise your car in local car sales publications such as newspapers and car sales magazines. We will advertise your car with 40 colour photos on up to 22 car sales Web Sites. These sites include carsguide.com.au and drive.com.au, the leading Web Sites in Australia for car sales, as well as our own site. We will give your car maximum exposure and get the buyer you want. 24 hours a day — 7 days a week. Finance — We can organise finance for purchasers of your car. If required, we utilise the services of Brokers Mutual Acceptance who are very competitive with all finance packages. Warranty — We will arrange tailor made warranties to suit the needs of the purchaser and the type of car. Repairs — We can organise any repairs required on your car to bring it up to a standard to be ready for sale. Detailing — We can organise professional detailing of your car to achieve a higher price for your car. Sometimes increasing your price by up to $500 – $1000. Trade Ins — Private sellers are normally not interested in trade-ins and this sometimes limits the opportunity to sell your car. Consign-A-Car will either take the trade itself and re-market it, or simply sell it off to a wholesaler at no profit in order to achieve a sale for your car. PPSR Check — We will obtain PPSR check as proof of title on all privately owned cars. Purchasers are also protected by dealing with a Licenced Motor Dealer. Safety Certificates — We can organise Safety Certificates to be issued or clients can provide them. It is a requirement by law that any vehicle offered for sale either by private sale or dealer must display current Safety Certificate. Processing Documents — Consign-A-Car will attend to all required paperwork in the sale of your car. This includes preparing and lodging of transfer papers, payout of finance owing and accounting to the vendor for the balance of sale proceeds. Note: The cost of any repairs and safety certificate will be accounted to the vendor prior to any work commencing, with a 10% surcharge for providing the services. Any costs of repairs will be at a discounted rate negotiated through Consign-A-Car’s network of repairers, therefore saving costs for our clients. Cost of Consign-A-Car’s 10 Point Marketing Plan is only $180 (plus GST) per month, total $198.00. Approximately $6 per day to professionally market your car. This is less than the cost of the advertising alone. Source The Car You Want — If you are looking for something special, Consign-A-Car will source that car for you at no cost to you. We have access to 1000’s of cars through our contacts in the industry and we will find the car you want. Auction Buying Facility — Consign-A-Car provides a personal auction buying service. We will attend the “Trade Only” auctions on your behalf, with you if you wish, and purchase the car you want. For a small service fee, you can purchase at the trade price and save $1000’s. For The Busy Professional — Consign-A-Car also offers special services for the business professional with limited time, or for those with limited knowledge of the car industry. We will organise the purchase of a new or used car and ensure you get, firstly a good car and secondly, a good deal and we will save you money. When selling your car through Consign A Car we encourage you to view our Checklist which outlines all of the items that we require you to provide. For further information regarding these services, please fill the form below or contact one of our offices.